In case you've missed it there's some stuff going on this weekend you might be interested in. 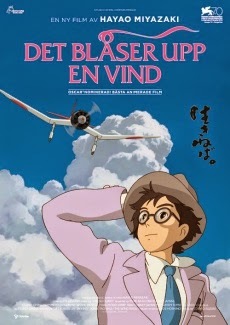 First off we have the premier of the Ghibli film 'Kaze Tachinu' or 'The Wind Rises'/'Det blåser upp en vind'. It will be screened at KiNO in Lund and at Spegeln in Manlö, in Japanese with Swedish subtitles. Check out KiNO's and Spegeln's homepages for screening info and tickets. Comic feast at Stadsbiblioteket!Lunds Stadsbibliotek has been on a mission - a mission to please all the starved comic and manga enthusiasts in Lund. The day has finally come for us to witness the fruits of their labour and dive into this new found trove of graphic novels. The main events will be this weekend, 5-6 April so check out the library homepage for more info. You on a hunt for anything and everything Asian? Asienloppis SKÅNE will be in Hässleholm this Saturday at 13:00–17:00. Don't miss this paradise of treasures! For the YOHIO-fans out there, he will be performing and signing his new album at Center Syd this Saturday at 14:00. Center Syd's facebook - YOHIO. Welcome to KodachiKai's blog! We use this as the main base for MoonCat Karaoke. Check out what songs are popular and request songs for future events on the Karaoke Song Request page.